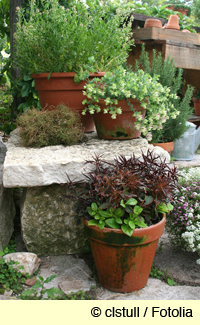 Keep your containers looking lush and beautiful even when Iowa's weather goes hot and dry. • Water generously. In hot weather, smaller containers can need watering as much as twice a day (a good reason, frankly, to go with large containers as much as possible). Plants such as hibiscus need watering every day, even in cooler weather. • Mulch your containers. Use shredded bark or other mulch to lay a ½-inch or so layer of mulch. It helps container moisture. • Make watering easier. Cluster your containers together. It saves time and it looks good! • Completely dry? 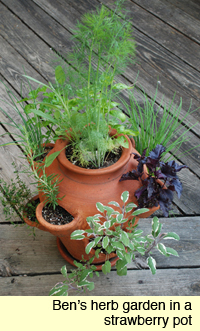 If a pot dries out completely, often the soil will shrink away from the sides. Then when you water, all the water just rushes down the sides, out the pot, and isn't absorbed by the roots. Remedy the situation by sitting the pot in a bowl, bucket, or big plastic box filled with water halfway up the sides of the pot. Let it sit for an hour or two. The water will slowly wick up through the bottom and completely rehydrate the soil. • Pinch your plants. Pinch off discolored leaves and faded blooms every time you water. This keeps plants attractive, prevents the spread of disease, and encourages further bloom. • Fertilize regularly. Constant watering flushes nutrients out of the container's soil. Work a granular slow-release fertilizer, such as Osmocote, into the soil at planting time. With flowering plants, fertilize them with a bloom-booster type liquid fertilizer every two to three weeks, as directed on the label. It doesn't cost any more than other fertilizers, and it really pushes them to bloom better! With foliage and other plants, use a general-purpose fertilizer, such as fish emulsion or regular Miracle-Gro, as directed on the label every two to three weeks. • Got bugs? Try this homemade version of commercial insecticidal soap formulations: Mix 1 to 2 tablespoons liquid soap (such as hand soap, not dish detergent) into 1 quart water. Put in a spray bottle and coat the leaves, stems, and undersides of the plant. Repeat in 5-7 days and in 5-7 days after that. Research shows that insecticidal soaps do work, covering and suffocating soft-bodied insects, such as aphids, thrips, white flies, and spider mites--the main attackers of houseplants and container plants. • Cut your losses. Doing all these things and the plant looks like heck anyway? Pitch it. After all, we have container plantings to make our spaces look better--not worse! Container plantings aren't meant to last forever. If the plant gets sick or spindly, toss it in the compost heap and resolve to do better next year!